Congratulations!!!! 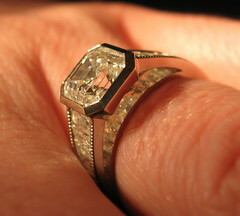 And that is a gorgeous ring. Thank you! We’re really happy! So happy for both of you!!! Can’t wait to see your ring in person and give you a big hug. Woo-hoo! Congratulations. And in an odd coincidence, you’re the third Dukie friend of mine to get engaged in about the past 10 days or so. Love is in the air! Wow — that is kind of amazing! Apparently someone Badger knows got engaged yesterday too! Isn’t it? It’s mesmerizing — just dazed, I am! Your ring is stunning! I wish you both nothing but the best! I wish I was closer to help plan! I love weddings! *SQUEEEEEEEE! * Congrats! You two deserve it. Thank you! We are happy happy campers! SHINY! (as badger said)! Thank you!! happy happy girl!